Sometimes things happen for a reason; that reason may not necessarily be obvious at the time, however, in due course, things fall into place and we can see and understand why! We had just come back from our favourite haunt in Sofia, our little bar in the woods which became a bit of an iconic place for us and a place which will be for ever in our hearts as having spent many great evenings in the company of terrific friends. I remember walking back home and completely from the blue feeling absolutely frozen. This is a strange thing as Bulgarian summers are hot! I arrived home and found I had a raging fever pushing 40 degrees and no other symptoms, none whatsoever. I didn’t have a cold, or even loss of appetite. This went on for some two weeks, it was a cycle of taking paracetamol, fever would disappear for 6 hours and then straight up to 40. Being left with no alternative, we took a short walk to Tokuda Hospital (Japanese Hospital in Sofia). I was seen to, had blood tests and a scan. The scan revealed I had gallstones. The Dr said it’s your gallbladder, come back tomorrow, meet the surgeon and have it taken out. Relieved but not cherishing the prospect of surgery we sought a second option. We were recommended a Dr which was the first choice for all ex-pats in Bulgaria, he was incredibly highly recommended. At the time I didn’t know how significant this Dr would become as he save me from suffering life-long serious brain damage. He came to see me at home, did some basic checks and asked me to come to his clinic the next day. He did further blood tests and a further scan. The blood test came back as showing me having a serious infection and the scan confirmed gallstones but didn’t feel I needed to have my gallbladder taken out (not just yet). There was no evidence as to where this infection was. He treated it with antibiotics and 10 days later I was back to normal, no more temperature, no more infection showing in blood tests. I arrived from our Christmas break in England on December 31st feeling drained and coming down with a heavy cold (sore throat, aching joints etc, etc). I had just driven a van back from UK and had had a bad trip due to snow and poor planning. January 3rd was the first day of term for Cathy and Katja’s first day at nursery. I woke up feeling dreadful, I mean really dreadful. Cathy was getting herself ready for school while Katja had breakfast. Cathy saw there was something not right with me, in fact something was very wrong, she rang school to explain she wouldn’t be in. I remember saying I wasn’t feeling right and I was going back to bed. I woke up with my hands tied to the side of the beed, connected to monitors, drips and lots of beeping machines. I tried to speak but my tongue was swollen and incredibly painful. I opened my eyes and there was blood on my pillow and a figure standing at the end of my bed. It was the Dr who I had met in July who treated me for the infection. He explained I had suffered a seizure, I was in hospital and my wife was at home. Would I like to speak with her. He explained they had to restrain me as I was trying to attack Drs and nurses as well as trying to rip out all the different things I was connected to. I then found out that it was now January 4th in the afternoon, I had been unconscious for over 24 hours. I spoke with Cathy who of course was extremely relieved to hear my voice. She was at my bedside soon after. After I went to bed at home I passed out, had a major seizure which was triggered by Viral Encephalitis. Encephalitis is a virus which attacks the brain and causes a swelling. When I had the seizure, I swallowed my tongue after trying to bite it off which explained the very painful injuries I suffered. When Cathy found me, I was unconscious and had to pull my tongue out as I was unable to breath. Once I was breathing again she called the Dr (the one who had treated me in July). He rushed across the city to come and see me, organised and ambulance and got me to hospital (Japanese Hospital in Sofia). Apparently the ambulance didn’t have a stretcher so I was strapped and tied to a chair and taken down on the lift!. Cathy also spoke to several other friends of mine. The brother of one of them is a top virologist in Bulgaria, he came to see me and I believe was the Dr who diagnosed Encephalitis after seeing the results of a spinal tap. Cathy had been told by neurologists that after an EEG that there was little brain activity, I had suffered a significant brain injury caused by the virus, they had no idea how long it would take for me to regain consciousness, it could be hours, days, weeks, months, years or perhaps never. The next few days were a blur, I had loads of messages and visitors. I only found out 6 months later how many visitors I had had, including people asking me if I remembered them coming to see me (no I didn’t!). It felt very much like trying to tie your shoelaces after one too many drinks. Mentally you can do it but your coordination just isn’t there. As the days passed I began to feel stronger and better. After 6 days in hospital I was ready to go home (Drs were not so sure but my Dr (the one who treated me for the original infection, he had been to see me on a daily basis and he also recommended I be released). I was sent home to recover but had to come back a week later for a further EEG, blood tests and another spinal tap. The results baffled everybody as they came back clear. This in itself is a little miracle as there was now no trace of the virus, I was virus free! I continued to have EEGs and blood tests every 3 months for over a year as well as being on preventative medication. In March of 2013 I was free from all medication and leading a totally normal life. It was thanks to the Dr who came to see me at home, called the ambulance and ensured I received prompt treatment as well as to my friend’s brother, the virologist who diagnosed Encephalitis and gave me the right treatment quickly that I have no lasting effects (apart from not being able to drink any caffeine). Any delay in treatment would have had serious consequences. Encephalitis is a serious condition which in most cases causes life changing damage to the brain. This includes epilepsy, loss of memory (long term or short term), loss of use of limbs, speech and in some cases death. As you would have heard or read, on May 10th I finally had my gallbladder out as it was playing me up. Speaking with the surgeon who performed the operation, he told me that there was evidence that I had at some stage suffered a fairly serious infection which ties up with what happened in July 2011. If I had followed the (correct) diagnosis at the hospital and done as they told me (to go and meet the surgeon the next day and have the gallbladder removed), I would have never met the Dr who came to see me at home for a second opinion. His quick action in getting me to hospital made the difference between living with a serious brain injury and leading a normal life. Had this not happened, the odds are very high that I would have suffered life changing brain damage. There are many other people who I will be eternally grateful to for their help and support who literally helped me to get back on my feet. Never have the words “things happen for a reason” meant so much to me…. Of course, there is a special person who for over two decades has been taking care of me….. THANK YOU! Well, it was my turn to go under the knife. Not something I was looking forward to but something I really wanted to get over and done with. This country never ceases to amaze me in so many different ways. We set off to hospital at 06:40, I had to “check in” at 07:30 – We arrived quite early but at that time of the day it is impossible to predict how bad traffic may be, so we set off nice and early. The checking in procedure was very simple and in no time I was in my own private room with massive LCD TV and all mod cons, this place is more like a 5* hotel than a hospital. Within a few minutes I was surrounded by people poking, prodding and inserting needles in both arms, giving me instructions and asking me questions (mainly while I had a thermometer stuck in my gob! About 45 minutes after arriving I was being wheeled out to theatre. I had a nurse assigned to me, a lovely chap who had excellent bedside manners. I was handed over to the operating team who were equally as charming, chatty and a great sense of humour. Most of them from the Philippines and only too happy to share about their country and tell me all about this beautiful place. I had several more injections and then it was crunch time. I was wheeled into theatre where I had a quick chat with the anaesthetist before starting to slur my words and head off into the land of nod! I woke up a couple of hours later, minus gallbladder and with four holes throughout my stomach and chest area. I felt like if I had just woken up from a very deep sleep, fully rested and ready to face the day. I had my gallbladder next to me before it was disposed of. 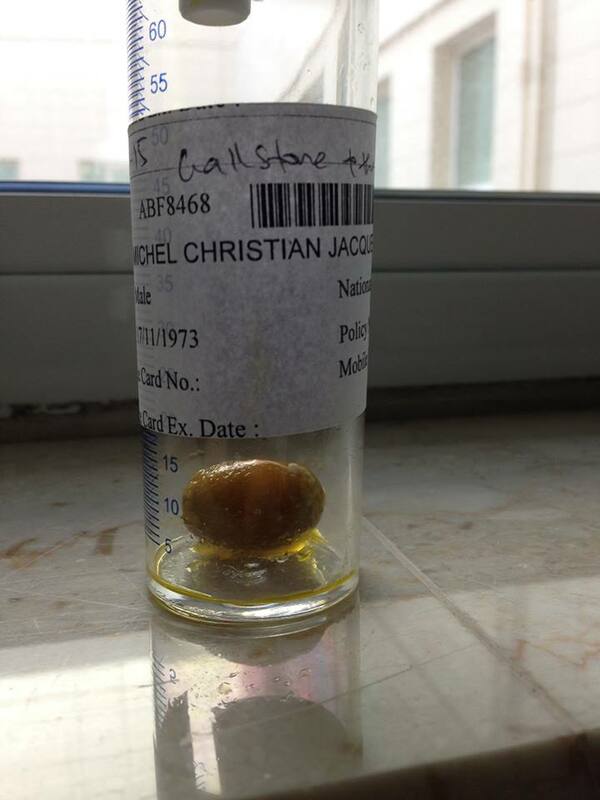 As well as this I also had one of the gallstones in a jar, which as you can see below, is pretty big! By early afternoon I was transferred to another room and patiently waited to be discharged. I arrived back home by 19:00 hrs which is exactly 12.5 hrs after having left! I went straight to bed as I am feeling pretty sore but other than that I am perfectly fine (so far), just a few pains here and there. From what I have read, the pain is mainly from when they pumped my chest cavity up in which not all the gases are released and it takes a few days to get over it.I am back in hospital tomorrow (Tuesday) for a further check up. Her class has a Panda Bear, Mr Sparkles. Kids who have been well behaved get to take Mr Sparkles home for the weekend. Mr Sparkles has a Journal with photos and little stories written by the kids, a very sweet idea, in my opinion. Well, this weekend, Mr Sparkles was out guest of honour, Katja was smiling from ear to ear on Thursday when she was told she was taking him home (don’t forget, our weekends are Friday and Saturday). Well, here you have a few photos of Katja and Mr Sparkles!